The mountain bike trails on the west side are horrible right now as the snow is melting. It’s a combo of greasy mud and snow. The road biking is great though if you can stand the wind chill! Kristy and I toured the west side, hitting Kings Canyon, Combs Canyon, and the roads in between. The mostly dry roads make a fun alternative to the awful trails. Word of caution though… Watch out for ice in the shade! We were caught off guard by a few patches yesterday, so steer around the shady sections when in doubt. Photo note: Kristy tried hard not to smile for Brian (aka oldmanandhisbike, aka BG Phone Home), who accused her of smiling too much. Looks like fun, but, Lawd, those pix makes it look cold out there! Riding in January can be tough. Even for the seasoned cyclist. Thankfully January is half over! The key to comfort though is a thin layer of insulation (as not to overheat), and a outer layer of windstopper. Adjusting the zipper on your wind breaker helps control your body temperature. I am sorry to be such a pest about this but the “girl” is just too happy. Must be the company she keeps, right Jeff? 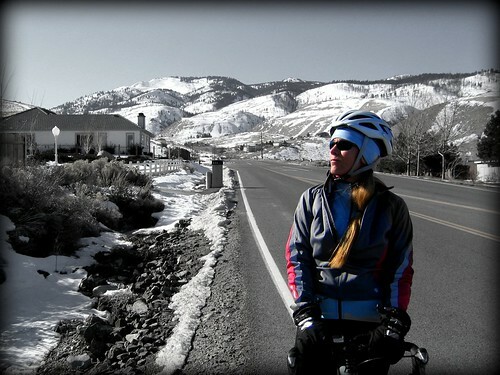 Road riding this time a year is always dicey and you mentioned one of the sneaky things that can ruin your day. Damn! There is just no pleasing you, Brian. That is a cool picture. Kind of BIKE Magazine BUZZ.